I’ve always loved reading about vintage track & field. Back in college, I drooled at the wealth of track knowledge contained in “A World History of Track & Field Athletics 1864-1964.” I was particularly amazed at how the athletics pioneers ran spectacular times despite a cinder track and spartan training methods. Before the advent of hurdles with plastic top-bars, the barriers were once actual sheep hurdles (back in the 1800’s in Britain), shaped like an inverted “T” (harder to fall than today’s “L” shaped hurdles) or robustly built (with wooden top bars). Take a look at the following documentary about Guy Drut, who won the 110m high hurdles silver in the 1976 Montreal Games, behind the double-armed Rodney Milburn. Although the 70’s were a far cry from the cinder-track days of Paddock and Owens, the video still retains that nostalgic aura. I like Drut’s style of hurdling. It’s efficient and a joy to watch. Not a single movement is wasted or exaggerated. Drut has a stable center of gravity all throughout the hurdling motion. Even though it lacks the sheer power of Liu Xiang and Allen Johnson (Drut is just a low 13 second hurdler), Drut’s graceful movements epitomize hurdling as an art form. Although the former world record holder could perhaps lean forward a bit more, Drut’s trail leg action snaps with so much vigor. If I were to choose one aspect of Drut’s hurdling that truly stands out, it is the snap of the trail leg. Hurdlers of all levels can learn important pointers from the way Drut executes the various hurdle drills. 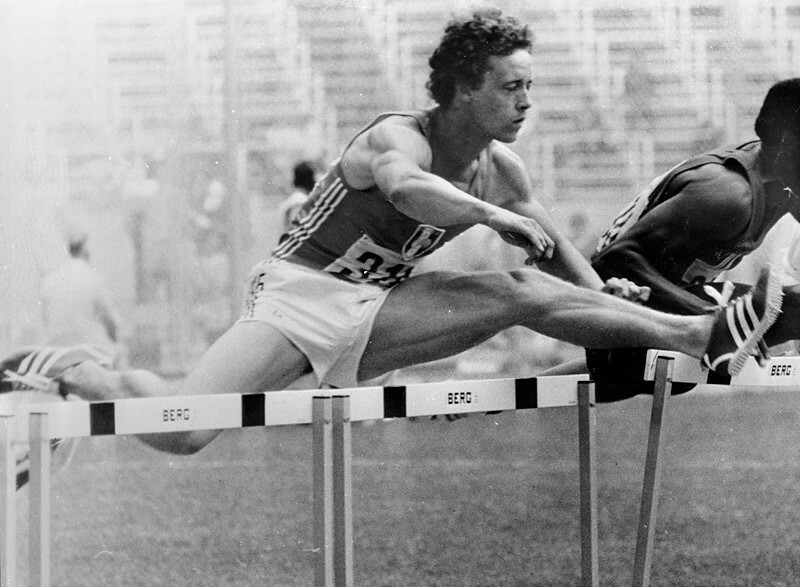 Since the main point of drills is to isolate and perfect certain aspects of hurdling technique, Drut maintains an erect body throughout, enabling his legs to do most of the work. For instance, in the quick step hurdling drill variation (3:44), Drut shuns the aggressive forward lean of actual full-race hurdling technique in favor of a straight back. As a result, his hips and legs are isolated, enabling one’s muscle memory to retain the correct movements efficiently. What I like most about the documentary (aside from the retro outfits!) are the voice-overs. I’m not sure if the lines actually come from Drut himself, but if that’s the case, then it isn’t surprising considering the suppleness and ease of Drut’s form. Even though I don’t always exhibit the aforesaid approach to hurdling, we share the same fundamental hurdling principles – of relaxed, deeply-wrought intensity.